“To me this is illegal. Our intelligence was undermined. 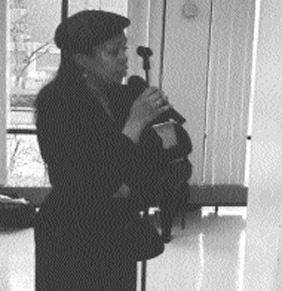 I feel as though you all lied and denied my families the right to vote,” said Crosby to CHA CEO Terry Peterson and others at the Tenants Services meeting in early December. The Chicago Housing Authority defended the move, saying they were merely returning the Madden Park row houses back to their original status. “The Madden Park town-homes have always been a part of Washington Park,” said CHA spokesperson Derek Hill in a December interview. The resident council elections are held every three years at public housing sites across the nation, according to HUD guideline for tenant councils. A public housing resident council “is synonymous with a tenant association and is headed by a Local Advisory Council president who is part of the Central Advisory Council, the governing body of the LAC,” the guidelines read. Eligible residents can run for several offices in the tenant council elections, such as the LAC president or vice president, secretary, treasurer, or building president. The 27 families living in the 34 row houses remaining at the Madden Park site were upset about being denied the right to vote and run for office. “Residents weren’t allowed to vote,” said Carol Kidd, a long time resident of the Madden Park Homes. “We didn’t vote because we didn’t know where to go or who to vote for,” she said. These 27 families and their row houses are what remains of what once was a mix of row houses and nine-story buildings amounting to more than 300 units. The development was opened in 1970. Crosby said nobody had the opportunity to say that they wanted to be LAC president for Washington Park or LAC president for Madden Park. “They denied us the right of choice, and a right to participate in this election. To me it was manipulative, because I should have never been told that Madden Park was not in this election. And if it was true, we should have been informed prior to elections, giving us the right of choice,” Crosby said. “Documentation should have been given out in a timely manner to everyone in Madden Park,” Crosby added. “Who [were] we supposed to vote for? There was nobody that campaigned or petitioned in this area other than myself. And since I was the only one that campaigned and petitioned them, who could they actually vote for? Who did they know to vote for,” Crosby said. The families had been treated like members of the Madden Park community for many years. The families received funding from the CHA with federal dollars under the auspices of the Madden Park Homes. The CHA even let several residents living within the row houses run in the Tenant Council Elections and become representatives of Madden Park. 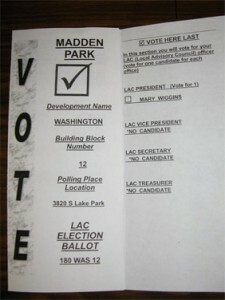 Crosby challenged the election results naming Mary Wiggins the LAC President for Madden Park. The results of her grievance hearings on the matter were not available by RJ press time. The site is currently under redevelopment with two other CHA sites that jointly received a $35 million HOPE VI grant from the U.S. Department of Housing and Urban Development in 2000 for redevelopment into one mixed-income community. Crosby said she learned about the change prior to the November 30 resident elections. She said the worker for the independent contractors running the elections also told her on November 23 that Madden Park was no longer a separate development. “I was told that Madden Park no longer exists,” she said. Crosby said she had a Chicago Housing Authority statistical report dated 1984 – 1985 that lists the 34-unit row houses within the boundaries of Madden Park, not Washington Park. And the results of the last election, documented in the January/February 2002 edition of Residents’ Journal, clearly show that Crosby is the winner of the LAC presidency for Madden Park, and Mary Wiggins was elected LAC president for Washington Park. But in this election, at the polling site at 3983 S. Lake Park Place, there were two separate election ballots listed for Madden Park Homes and one for Washington Park. Both ballots had Mary Wiggins, the LAC president for Washington Park listed. No candidates were listed as running for any of the offices, such as secretary or treasurer, on the Madden Park ballots. But candidates were listed on the Washington Park ballots. “Why tell me I’m not a part of the elections, and yet Ms. Wiggins’ name is under Madden Park? That question never got any clarity,” Crosby said. After the December 4 Tenants Services meeting, CHA CEO Terry Peterson said that his legal counsel would give me documentation showing when Madden Park was included in the Washington Park Scattered Sites. Derek Hill, the CHA director of public affairs, insinuated that Peterson only told me that I would get the documentation on that day to brush me off. “Mary I’m not the boss, but sometimes he just says things to people. It takes a lot more than just ‘boom,’ getting it to you. So, I don’t know if I will be able to get that to you today,” he said during a mid December phone interview with a CHA general counsel. CHA failed to provide RJ with the written documentation by press time. Hill said that the row houses were always a part of Washington Park Scattered Sites. Hill confirmed that Crosby represented the Madden Park residents in the working group for the Madden/Wells redevelopment plan. But he added that he didn’t know why Crosby was representing Madden Park residents in the first place since her unit is under Washington Park. Crosby took part in the working group for the redevelopment process of the Madden Park, the Darrow Homes that were demolished in June 2000, and the Ida. B. Wells sites. This entry was posted	on Tuesday, November 9th, 2004 at 7:49 pm. You can follow any responses to this entry through the RSS 2.0 feed. You can leave a response, or trackback from your own site.